Gregg's Blogg » Blog Archive » Dunn is done! 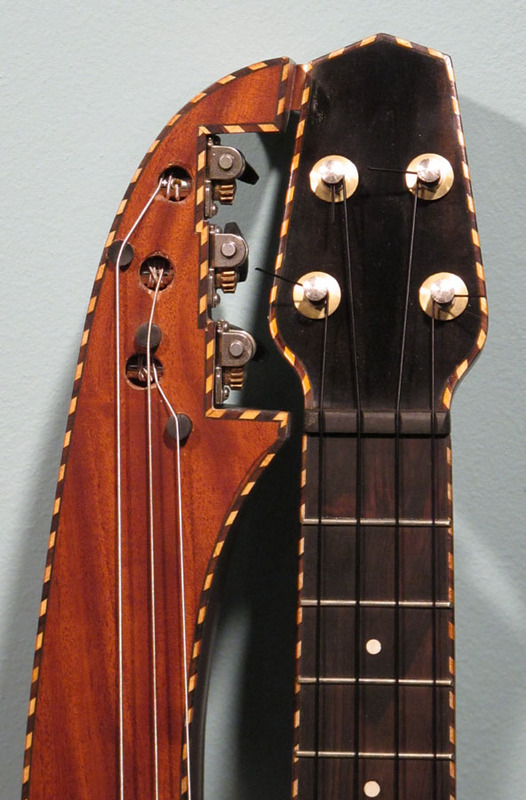 Wow, I just realized that this is actually my very first new harp guitar commission. OK, not exactly a guitar… (I’m starting small). 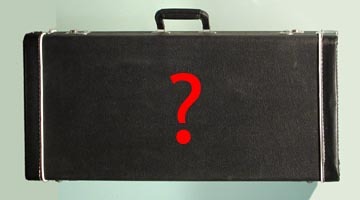 The question for you, the reader, is: Well, what is it?! Sorry, you have to guess (if you guess wrong, the links won’t work). And no cheating! OK, here’s the story. I’ve only fairly recently warmed up to the idea of new instruments, being a “vintage snob” and a collector more than a player. So at the end of HGG6 in Portland 2 years ago, Ben (Meulle-Stef) was telling me that attending luthier Michael Dunn (from Vancouver, Canada) was planning to retire. Well, it turned out that (like most of us) Michael wasn’t retiring cold turkey, or soon – he was just deciding to become more selective about his projects. But at the time, I panicked! See, Michael has long been one of my favorite luthiers. First, with all his Selmer-style Gypsy jazz guitars, each one different than the last, with surprising wood selection every step of the way (and they’re great guitars). 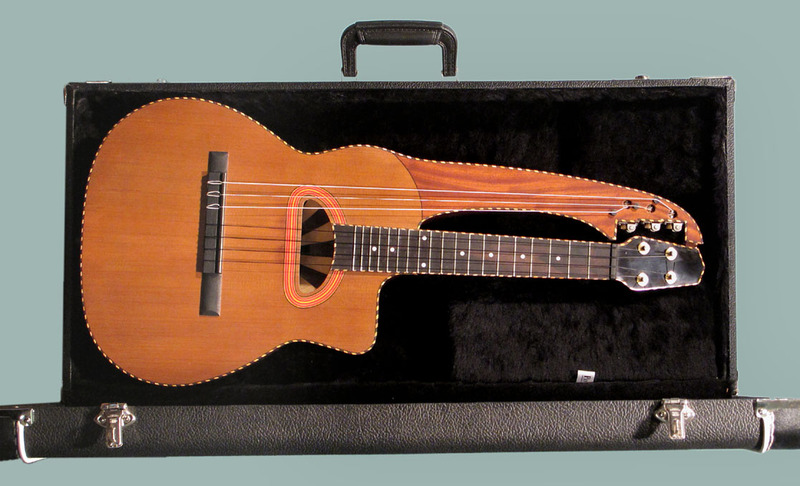 And of course, I’ve gotten a huge kick out of all his Knutsen-inspired harp-ukes in all sizes and colors. So, I figure, better get on his list before it’s too late. But I decided to give him a challenge. I’m thinking, I don’t need a Gypsy guitar, as much as I’d love one. And a Knutsen-y thing would just look odd next to all the originals. So what? Hmmm…could I possibly combine the two…? When ready, click on the image and see if you are remotely close, and if so, could you honestly envision it?! How’d ya do? Cool, huh? And boy, did he get it right! 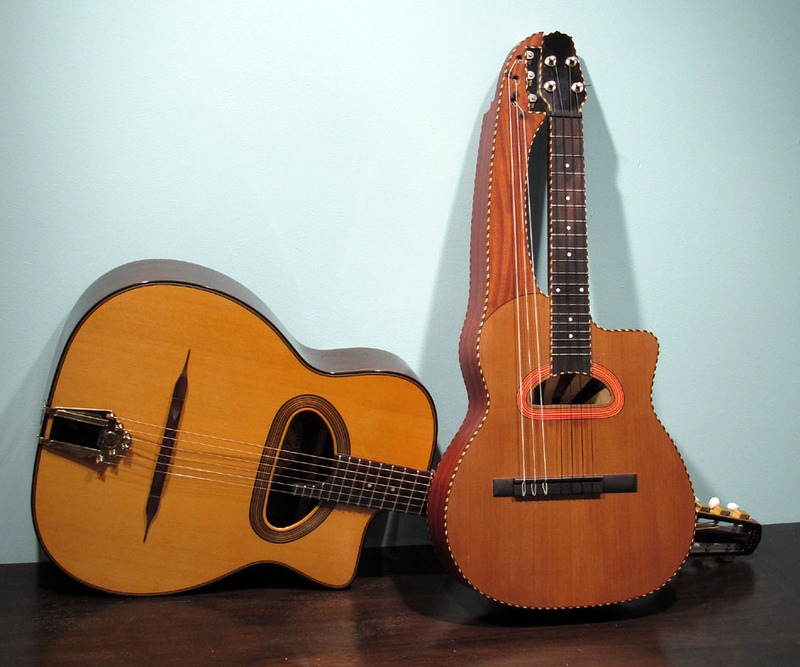 Here’s what the original guitar version, a 9-string classical instrument, looks like. The trick was to scale it down, but create a realistic, usable instrument. We decided on tenor scale (17″) , though the proportions would create a baritone-size body. Here it is compared to a standard Gitane Selmer copy. Woods are a nice red padauk for the back and sides, red cedar for the top, and mahogany for the front of the arm. The bridge is stained sapelle, while the reflector is ebony and holly. Ah, the reflector…this was something I insisted on, one of Michael’s trademarks on his Gypsy guitars, a modification of the baffle/sound reflector set-up seen on some Selmer guitars. 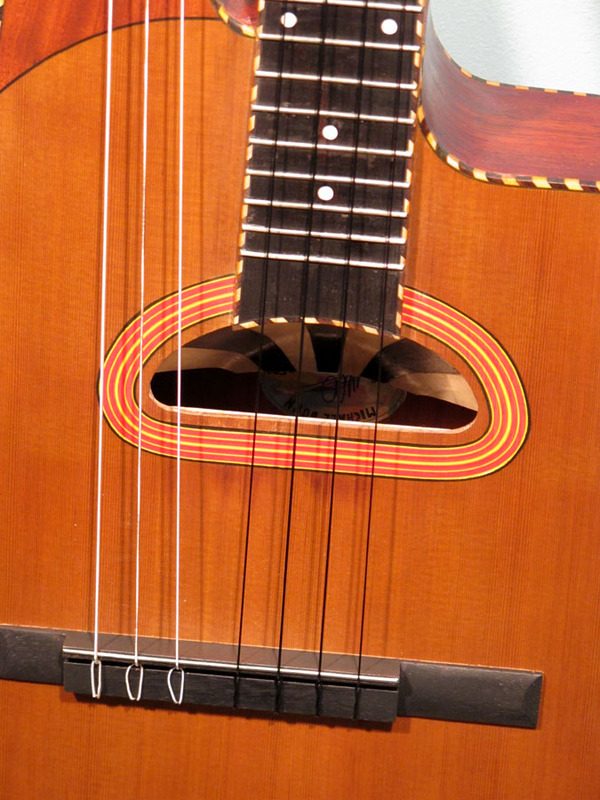 The tone is great coming off the soundboard, but there are also interesting and dynamic “sound eddies” coming out of that unique soundhole. 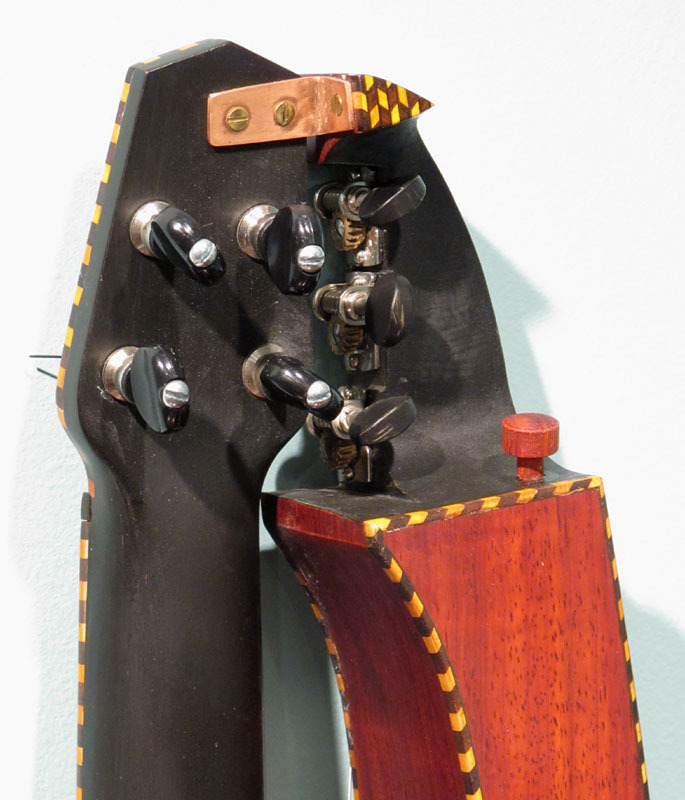 The rosewood and maple rope binding (everywhere – even that little space behind the arm tip!) is of course a nod to Knutsen. All in all, Michael feels instrument #589 “is a good meld of Maccaferri, Knutsen and Dunn.” I would agree! P.S. Up next for Michael? I assume this will make an appearance at HGG8?! No, I won’t have time to figure out what I’m doing with the basses. Or how to play uke with acrylics, for that matter! Sweet! Nope, I was wrong with my guess. Too bad John King passed away; he probably would’ve loved that!